When traditional chemical adhesives fail to sufficiently bond dissimilar types of materials, engineers often turn to plasma treatments to solve complex adhesion problems. Whether bonding metal to plastic, silicone to glass, polymers to other polymers of different durometers, biological content to polymeric microtiter plates or even bonding to polytetrafluoroethylene (PTFE), plasma can be used to promote adhesion. Adhesion promotion can be achieved by increasing the surface free energy through several mechanisms, including precision cleaning, chemically or physically modifying the surface, increasing surface area by roughening and primer coatings, according to Michael Barden, of PVA TePla, a company that designs and manufactures plasma systems. Plasma is a state of matter, like a solid, liquid or gas. When enough energy is added to a gas it becomes ionized into a plasma state. The collective properties of ions, electrons and radicals can be controlled to change the properties of surfaces without affecting the bulk material. In this way, plasma is a powerful tool in solving surface preparation problems such as precision cleaning and decontamination, increasing surface wettability and adhesion promotion. In addition, plasma can also be used to polymerise monomers onto surfaces through plasma-enhanced chemical vapour deposition (PECVD) to provide thin film coatings. The net effect is a tremendous improvement in bonding – in some cases up to a 50 times bond strength improvement can be achieved. For a majority of applications, plasma treatments are used to increase the surface free energy of the material. Surface energy is defined as the sum of all intermolecular forces that are on the surface of a material, the degree of attraction or repulsion force of a material surface exerts on another material. When a substrate has a high surface energy, it tends to attract. For this reason, adhesives and other liquids often spread more easily across the surface. This wettability promotes superior adhesion using chemical adhesives. On the other hand, substrates that have a low surface energy – such as silicone or PTFE – are difficult to adhere to other materials without first altering the surface to increase the free energy. There are several plasma methods to increase surface energy, including physical and chemical plasmas along with PECVD coating surfaces. In addition, plasma can increase the surface area of bonding by nano-roughening a surface. Surfaces that are highly ordered or very crystalline, tend to have very low surface energies. To disrupt that order, ionised plasma gas is used to bombard the surface. The most common and affordable options are helium, nitrogen and argon. According to Barden, the selection of the type of gas is determined by the amount of ion momentum required to disrupt the surface order. “To create more of an effect, gases with higher atomic masses can be used,” he explains. “At one end of the spectrum you can use helium for a light impact on the surface, whereas argon, which has 20 times the atomic mass, will impact the surface with much higher force.” This creates a surface with a high dispersive effect, another way to say high wettability. Another method of increasing surface energy is to create a polarisable group on the surface by using chemical plasma. For example, O2 plasma can be used to create surface hydroxyls that allow liquids to spread through hydrogen bonding mechanisms. Plasma technology can also be used to control the surface chemistry of PTFE to improve bonding, not only for adhesives, but also inks, coatings and biomaterials. PTFE and other fluoropolymers are known for their low coefficients of friction, exceptional chemical resistance and biocompatibility. They also offer high melting points, low dielectric constants, and resistance to flammability. However, the application of PTFE is often limited due to the material's inability to be adhesively bonded to other materials. It has an inherently low surface energy and poor polarisability. “When a surface is really hydrophobic, suchas Teflon, it’s very difficult to bond to it,” says Barden. “If you apply a liquid or adhesive, it just won’t spread effectively.” Fortunately, adhesion properties of PTFE can be dramatically improved using PECVD techniques. The process creates a coating with polar functional groups on the surface that act as excellent anchors to either hydrogen bond or covalently attach hydrophilic coatings. Although ammonia gas plasma activation is traditionally used for this purpose, PVA TePla has developed an alcohol PECVD process that improves bonding strength 1.5 times over ammonia and 8.5 times over the untreated surface. The process also extends surface activation lifetimes. Whereas downstream processing and staging time was once confined to a six-hour window, it now extends several weeks, providing more flexibility in manufacturing environments. This technique opens the door to new methods of chemically engineering surface properties of PTFE. The ability to selectively functionalise the surface with primary amines, hydroxyls and carboxylic acids means that engineers can now broaden the use of this material in medical technology. Silicone over-moulding is often used to protect electronic boards from outdoor weather conditions. Silicone is preferred due to its low water absorption, wide temperature range of use (typically -50°C to 204°C), thermal stability, electrical resistance and stability to ultraviolet light exposure. Unfortunately, the topography of a PCB means the silicone must bond to many types of materials, including polymers, metals, alloys, ceramics and the FR-4 board itself, all of which have unique surface energies and chemistries. Without proper adhesion, silicone can begin to delaminate, not only at the edges of the PCB board but also in the form of small air pockets on, or around, components. This can lead to moisture ingress and subsequent corrosion or electrical shorts. From a surface chemistry perspective, having a diverse group of materials to treat is even more difficult because you need to develop a process for each and the recipes can be different. It is very difficult to find any uniform treatment that works with all the different components on a printed circuit board. Historically, chemical primers have been used to activate difficult polymer or metallic surfaces to promote adhesion. However, many of these primers are comprised of solvents – along with catalysts – that are toxic, caustic, and carcinogenic or are potential leachables. 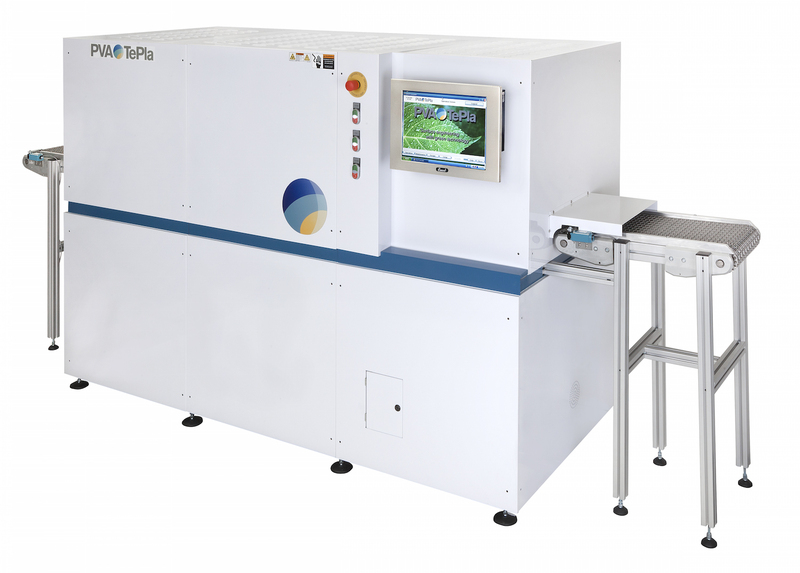 As an alternative, PECVD can be used to deposit thin films of silicon dioxide to the substrate as an intermediate layer to improve the adhesion between a surface and a functional/linker coating or directly to a coating of choice. Within this family, the most popular are hexamethyldisiloxane (HMDSO) and tetramethyldisiloxane (TMDSO). HMDSO, in particular, is an affordable and flexible reagent that is commercially available in a high purity, liquid form. The volatile, colourless liquid can be plasma-polymerised to create a variety of surface coatings. Depending on the composition of oxygen to HMDSO, the property of the surface can be hydrophobic or hydrophilic. Guide wires are a good example. To ease insertion, guide wires are often treated with proprietary surface coatings to make them more lubricious. However, stainless steel guidewires are very resistant to the adhesion of lubricious coatings and other organic thin films. This problem can be solved by first applying a thin siloxane layer via a PECVD process, followed by a second PECVD process that applies a functionalised coating that readily grafts to lubricious coatings. 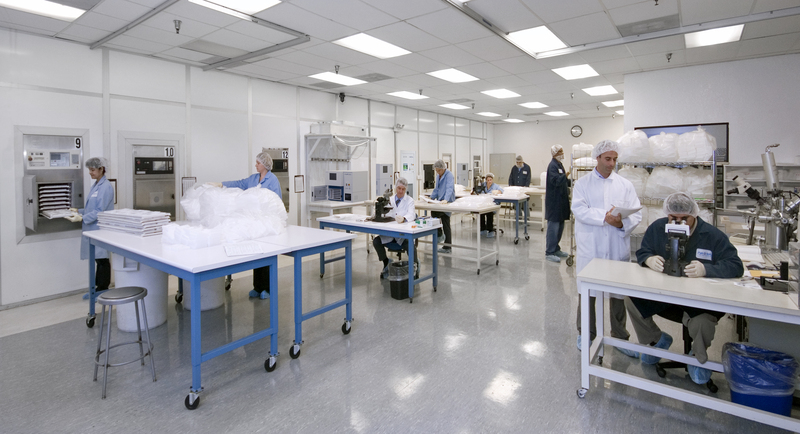 According to Barden, when companies present PVA TePla with a challenging surface chemistry problem they are encouraged to visit the firm’s lab in California, USA. This gives them an opportunity to brainstorm with their technical team and run experiments together. It is during these technical customer/supplier meetings that many of the best experimental matrices and ideas are produced. In addition to designing and manufacturing plasma systems, the company also serves as a contract manufacturer and so has the in-house equipment to run parts and conduct experiments, with full customer involvement. To conduct adhesion-testing experiments, Barden says the customer often already has proprietary and sometimes confidential techniques and equipment in place. However, to provide qualitative data on adhesion improvement, PVA TePla uses goniometers to measure surface free energy and the respective dispersive/polar components. Contact angle goniometers measure the angles of liquids on the surface of the substrate to determine the surface energy. Although these tests are often conducted using water, this only measures the polar component so PVA TePla also uses other organic liquids to measure dispersive components as well. Gas plasma can also provide surface conditioning of in vitro diagnostic platforms prior to the adsorption of biological molecules (protein/antibody, cells, carbohydrate, etc.) or biomimetic polymers. This includes precision cleaning of the substrate at the molecular level, along with raising the surface energy to improve surface assimilation of the intended content. However, some in vitro diagnostic substrates require more selective surface chemistry to immobilise a customer’s proprietary molecules. For this, PVA TePla has recently developed methods for chemically functionalising various polymer platforms for the selective adhesion promotion and conjugation of bio-active molecules. This is achieved by providing particular chemical functionality or linker chemistries at the surface, allowing conjugation of a wide variety of molecules ranging from small molecule drugs to peptides to larger biopolymers such as carbohydrates and antibodies. Amino, carboxylic, hydroxyl and epoxy functionalities are important examples of the chemistries that are readily obtainable using a gas plasma surface treatment.